Hilaire Barnett’s Constitutional and Administrative Law has provided generations of students with reliable, accessible and comprehensive coverage of the Public Law syllabus. Mapped to the common course outline, the thirteenth edition equips students with an understanding of the UK constitution’s past, present and future by analysing and illustrating the political and socio-historical contexts which have shaped the major rules and principles of constitutional and administrative law, as well as on-going constitutional reform. This edition has been fully updated and includes discussion of the implications of the United Kingdom's potential withdrawal from the European Union on the constitution, including the impact on the legislative supremacy of Parliament and the relationship between EU and domestic law after leaving the EU. Developments on the negotiations of the future relationship between the UK and the EU will be discussed in updates to the companion website. 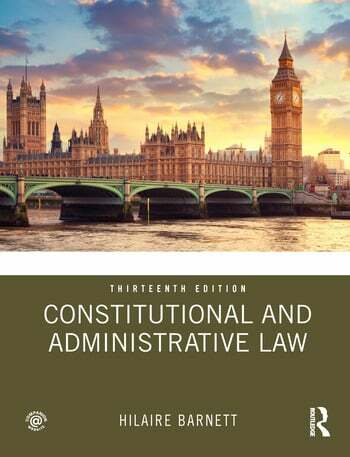 Ideal for students studying constitutional and administrative law for the first time, this book offers clear explanations of the challenging concepts and legal rules in public law.